Dry Month of February, wait March, or April? Both? So I’ve spent the last several years with a regular fitness regimen and a diet mostly based on non-processed, fresh foods. However, if you’ve read my other posts, you know that I fully believe in moderation and that if you deprive yourself, any goals you have or enjoyment you’ll receive out of a healthy lifestyle will be difficult to achieve. Period, exclamation point. The one thing that we’ve always indulged in? Alcohol. I mean, we don’t have kids so a couple of drinks while watching TV has always pretty common in our house. No joke, our bar is stocked. Yes, I built a bar. It’s also a buffet/display china cabinet. Am I making excuses here? Maybe. Hey, I’ll even share a pic of the bar below this post. When I quit my job of 13+ years this past October, my anxiety and insomnia spiked. Here I was with zero direction and days on end spent alone, no motivation. Of course, I worked out, went grocery shopping, looked for jobs in Atlanta, and continued to cook and eat healthy. However, at night we’d still be drinking cocktails on the regular while watching TV. I read this article, of course because I always read stuff online and HAVE to try it, about quitting drinking for a month and was all in. When I mentioned it to my bestie, she was on board too. Now we each had a co-pilot and support in case we started to cave. My motivations went beyond fitness and years of drinking. Let’s face it—alcohol is a depressant. When you’re not working and dealing with all the mixed emotions of quitting a job of 13 years that you loved, you do NOT need to add alcohol into the mix. You just don’t. How did it work? So, we started by thinking it would be in February. Wait, what about Valentine’s Day? We had to have some wine with dinner with our husbands if they did the holiday correctly, right? Then, we thought we REALLY should properly celebrate my birthday on February 23 with the girls and some wine. Okay, so scratch February. During that first week, I won’t lie, we both needed that moral support. Our husbands work together, freelancing and at the station where I previously worked. Those long hours lead them to come home and wanting to unwind with a cocktail. Anyone who has been the designated driver can tell you it’s painful to be sober when others are getting buzzed. Enter, the BFF support system. Phone calls, text support and reminders of goals. We did it all. And it was a necessity. Our lifelines. After 2 weeks, it was amazing. We both noticed feeling more energetic and better nights of sleep. For me, this was mind blowing. I’m an insomniac so I was floored. I also noticed more muscle definition within a week. If you work out regularly, you may notice this is similar to that PMS water retention effect. This time, it was not that time of the month, so BONUS! I was also more encouraged to discourage my husband’s suggestions to order pizza, which we do probably once a week. Call it the sobriety domino effect. Now, I won’t sugar coat it. There were 1 or 2 lapses. I had a death in the family and that lead to me meeting up with my brother and some whiskey drinking. Lots of it. Since this was my first time drinking in 2 weeks, I stupidly thought I had the same tolerance, meaning that 3 glasses of about 2 1/2 fingers on the rocks would be fine for this tiny person. WRONG! I rocked the worst hangover I have had in 4 years. I tried to run the next morning and made it 1 mile in 10 minutes and that’s being kind to myself. I can typically run 3-5 miles (8 min/mile) easily. Poor showing. Of course, I was also super depressed that next day. The second time I drank during this dry month, I had a few glasses of wine I was with my husband and after I felt a buzz, I started crying uncontrollably about how I shouldn’t be doing this to my body, and my emotions. So, I really started to see how poisonous the alcohol was to my entire system. What happened? Well, my bestie, Annie, completely agreed. Of course I had 2 glasses of wine before the Amy Schumer show, but now I really don’t drink very much at all. I think I’ve bought 2 bottles of wine since March. Oh, and let me tell you, I had gotten into a period of buying box wine after our last holiday party and the magnum bottles. The last two I bought were your standard 750mL. I was in Atlanta for a week and did some drinking there, but nothing to the degree of where I was on a regular basis before this experiment began. The funniest part? While all of this experiment was coming to an end, I started seeing a sleep specialist to help my insomnia. You know when you go to the doctor and they ask you how much, on average, you drink each week? We all fudge this one, right? It’s like when they ask the first day of your last period. Come on! Does anyone ever keep track of that?! Well, I told her about the dry month but decided to be full-on honest about what it was like prior to March. I told her that, on average, I probably drank 5 nights a week and maybe 3+ drink each night. She was floored. She told me no one gives those details honestly. I’m proud to say that now I’m really only drinking maybe once every couple of weeks. Actually bought a bottle of wine last night and only had a glass and a half. It feels pretty awesome to wake up with no fogginess. Our “bar.” A buffet/display cabinet I refinished by taking a professor’s office credenza from university salvage ($40), adding lots of coats of paint, glass to the doors, & under cabinet lighting. After looking for a job in Atlanta casually since August and in earnest since September, I admit I’ve had my highs and lows during the search. As one job appears to become close within my grasp with phone interviews/writing exercises/reference checks, my excitement builds and I’ve tended to take a pause in the hunt. This can lead to many missed opportunities. It can also cause a BIG disappointment since I’ll have effectively placed “all of my eggs in one basket” for a certain amount of time. If you’re in the financial situation where you aren’t strapped to get a job immediately, that can be good and bad. It can provide more time to polish your résumé and LinkedIn profile, to connect with recruiters, get advice, etc. However, it can also rob you of daily motivation and further the spiral of disappointment when you’re rejected and let you allow yourself to just fall down that shame spiral. Hey, you may feel you deserve a break and some wallow time before picking that search back up again, right? WRONG. Well, not too much time anyway. I’ve been falling into some several traps that mislead me from my search, but I’ve been doing much, much better for the past several months. How have I been successful in staying positive? Stick to a schedule. It’s easy to decide to ditch the alarm and start your day in front of the TV. I’ve begun setting an alarm, and now moved my job search and creative writing to the dining room, where I’m not facing the TV. I try to schedule meals, time for the gym, and social engagements. Make lists. I’ve been tracking jobs to which I’ve applied and the status for each one. How I’ve followed up through InMail, email, etc. Find new interests. 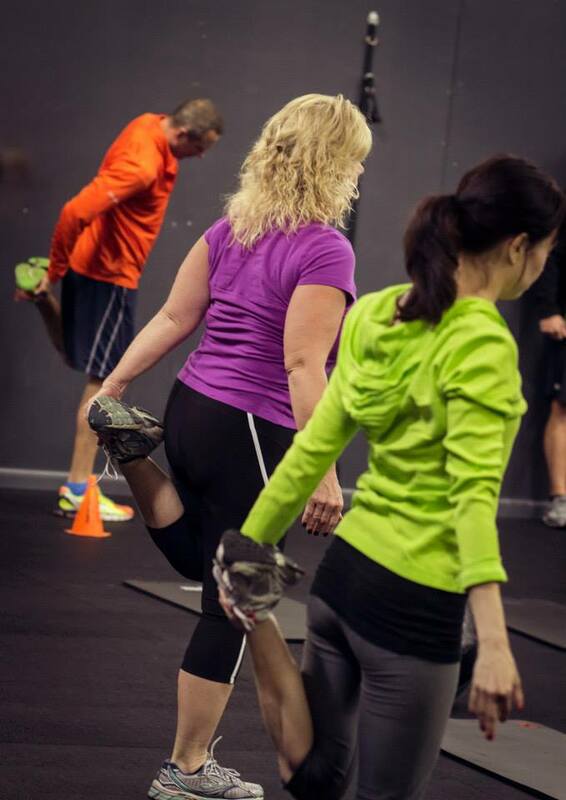 I’m currently, albeit slowly, taking a course in fitness coaching through The National Academy of Sports Medicine. I’ve also begun to create more content on my blog and done more creative writing offline. Get out of the house and keep social relationships. This is extremely important. 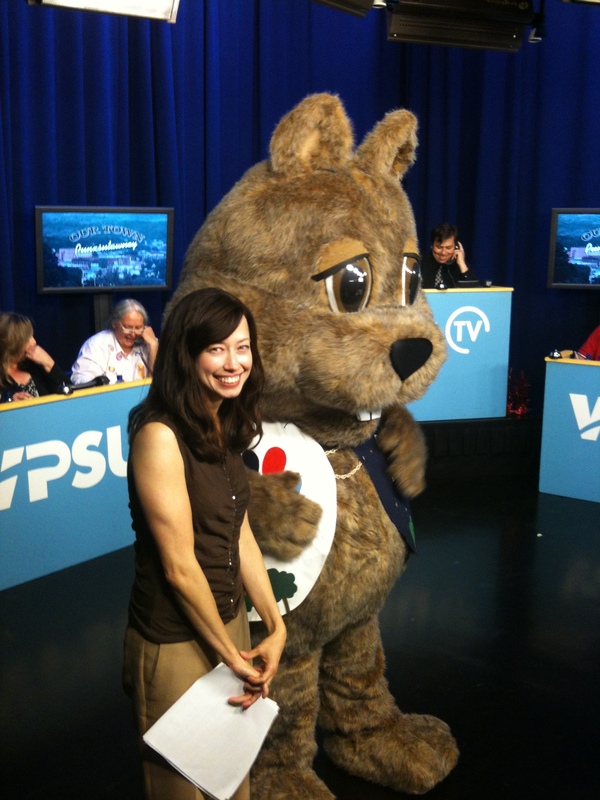 Most of my relationships revolved around my job at WPSU. I now have regular lunches with friends and monthly girls’ nights the last Wednesday of each month. Be nice to your body. I’m not gonna lie, this is a toughie considering you’re now at home and have 24/7 access to food, and much of that time is unsupervised (no judgement). But, if you read some of my posts on diet and nutrition on my Whit Approved page, you’ll find some tips on treating your body better. You’ll have much more energy—I promise. I am currently going through a dry month with no booze and increasing my H2O. Just try and be kinder to your body. Your mood, energy level, and waistline will thank you. Move. As in exercise. Even if it’s a walk around the block or simple stretching, odds are now that you’re not working everyday, you’re on your feet much less each day. I know I ran around all day at the station interacting with people so I make it a point to run and get in some interval/boot camp training everyday. Get help. Contact recruiters and headhunters. Connect with them through LinkedIn, through their websites, etc. Also, ask friends for help reviewing your résumé, writing recommendations on your LinkedIn page, reviewing your LinkedIn profile, etc. Ask for their honest feedback. I happen to have a sister in HR and she completely retooled my résumé. It was such a helpful experience. Communicate. Talk to your BFF, spouse, friends, former colleagues, etc. about your struggles. Maybe they have some tips. Final word of advice…go easy on yourself. This is a VERY difficult process for all of us. We need to soothe ourselves every once in awhile, whether it’s a jammy day with the kitty in front of the TV, a few drinks, comfort food, or just a long nap. As long as you don’t get stuck in that rut, you’ll power through it and get back to work—on the job search and eventually in the position of your dreams. Fingers crossed! I honestly don’t know where I’d be without my BFF. She’s the one I call just to check in and chat to see how she’s doing, to give her the update on my day, to tell her about the latest episode of a TV show she does’t even watch, etc. Last night I came across 2 articles on one of my favorite blogs, Hello Giggles, about friendship and had to immediately share them with my gal. One discussed a friendship to-do list for 2016. It was funny because we had already talked about multiple things on this list — a vacation, starting a book club (well, not a book club, but we both initiated a monthly girls’ night), etc. Then she hit me with a whammy without even reading the list! This is when you know your BFF is YOUR BFF…one of the items on the list is to write special moments that you have together down, date them, and keep them in a jar. We went out Monday to a show and to our surprise found out something we don’t know about each other. Shocking, I know. Annie suggested writing it down, just like this list suggested. I had not even told her about this jar idea. Mind reader. That’s why I love this lady. For the 2016 BFF To-Do List check out the full article on Hello Giggles. The second friendship article featured 30 fun questions to ask your best friend. Annie and I intend to do this next time her little guys are napping. It’ll be a fun way to find out any other things we didn’t know about each other—like the crazy fact we didn’t know that we both love the novel Little Women and discovered that we shared that love Monday night at a musical theatre show featuring “Some Things Are Meant To Be” from the musical, Little Women. Hint, that was the funny moment we learned something entirely new about each other. Something that hasn’t happened to us in YEARS. This will be written down and placed in a jar. Every minute spent with friends is special and when you discover new things about the people closest to you, it just makes that time even more precious. I was working at WPSU/Penn State for almost fourteen years. It was my dream job. I was a producer/director. 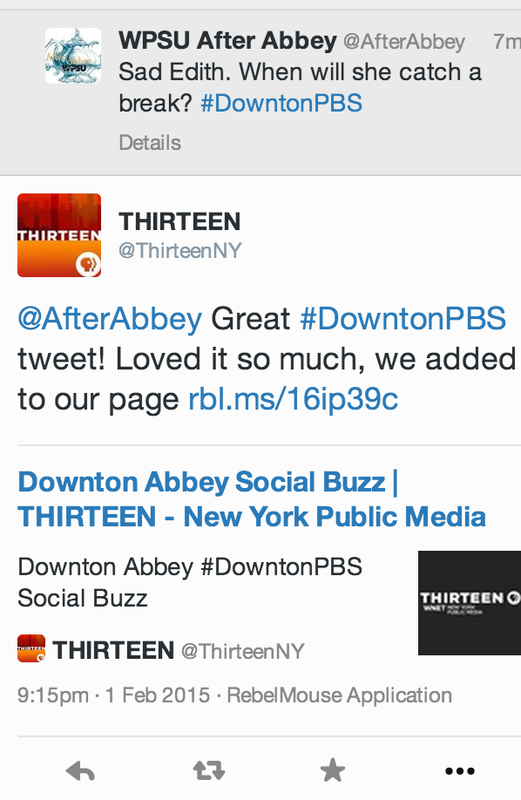 Not only was I a producer, but I was assigned to productions for broadcast and as a PBS member station, this meant programs with a regional focus that connected with our audience. Yes, my dream job. I produced programs that took me throughout the 29-county viewing area where I taught community members how to become visual storytellers and the collaboration of our work resulted in 60-minute documentaries about their hometowns as well as several Emmy nominations. I produced multiple high-profile interview programs, both live and taped. Some of these were in studio, others in the field. I also developed several projects, one of which I hosted myself. In all, it was a privilege to be a part of the organization. So people were shocked when I left at the end of September. I had taken some time off to figure out if I wanted to go or stay, but in my heart I knew it was time to move on. While I loved all the projects I worked on and am proud of the work I did at WPSU, there is so much more that I want to do. I felt that I needed to move on so that I would have those new opportunities. With VERY mixed emotions, I left the job that I have had most of my adult life. This was the place where I met my husband, where he proposed on camera, where I learned so much from all the wonderful colleagues at the station. Leaving WPSU was possibly the most difficult decision I’ve had to make. I’ll really miss the creative collaboration that I had with so many of my co-workers. I’ll also miss hearing from our audience members about how much they loved the latest episode of Masterpiece or Doc Martin. What’s next? I’m looking for something new, maybe in someplace new. I know I’m excited to see what happens next. P.S. As I decided to follow this new path in unchartered territory, I have found Tess Vigeland’s book, Leap, extremely inspiring. As a HUGE Marketplace fan, hearing Vigeland’s story about leaving Marketplace, her “dream job,” has been a true comfort. I highly recommend it! If you haven’t read or seen the video of Reese Witherspoon from Glamour’s Women of the Year Awards, stop what you’re doing. Read it. Now. One of the things she discusses is the negativity that surrounds women when they are linked with ambition. How ambition is perceived as a negative for women, yet positive for men. I have certainly seen this in the workplace and I’m sure most women have encountered this on some level as well. Ambitious women have been blamed for being power-hungry, territorial, difficult, and countless other negative traits. It’s frustrating for women in the workplace. Reese Witherspoon’s speech is well-written and spot-on. Definitely worth the read and hopefully spreads some inspiration for ambitious women. So I’ve been an indie rock fan since, like forever. Truly. I was one of those snobs that swore the only way to hear music was at a live show or on a limited edition vinyl record. During high school, my best friend and I would sneak out and drive into inner city Memphis to see shows at the New Daisy Theatre. I continued that tradition into college, but the snobbery got so much worse. That was when I became a college radio station deejay, then programming director, station manager, etc. Going to Penn State gives you a short drive to NYC, Philly and Pittsburgh to see an underground band with 50-100 other adoring fans who, “swear they knew of the band’s brilliance first.” And you could make it back in time for that 8:15 a.m. class. Who knew that entering the second half of my thirties and marrying someone with the COMPLETE opposite taste in music would get me to me today, where my current anthem is “Mean” by Taylor Swift? Sure, it could have something to do with the lyrics striking a chord (see what I did there with the pun) and where I am in my current situation, but I like to think I’ve also learned that it’s just not right to judge everyone else about what they like and don’t like. So what if I’m obsessed with The Walking Dead (repeating episodes ad nauseam) and I also watch Empire and Scream Queens and yeah, I just binge-watched Gossip Girl. And those are not even what my husband considers my “embarrassing” media addictions. Clearly he’s still judge-y. My point is that I spent too much time worrying about what others thought and part of that was being careful about liking certain things and spending a lot of effort staying up with the trends of the social group with which I identified. For the last fourteen years, most of my identity has been my job. As I take some time looking towards the next phase in my career, I’m also taking time to rediscover some of the things I may have left behind that made up my personality too. Having a job can be all-consuming, but so can keeping up appearances to fit into a particular social group or with certain friends. I guess I’m finally working on learning to be myself again. I just decided I need a new challenge. I’m about to embark on a new chapter in my life/career and as I’m preparing to do so, it would be great to find something I love and take it to the next level. I spoke to my trainer and the owner of my gym about becoming certified as a trainer/coach. I’ll be taking a course through the National Academy of Sports Medicine. I’m pretty excited and eager to see if I can pass the exams. I’m also about to run my longest competitive race as a relay with some good friends. We’re doing the Tussey Mountainback on Sunday, October 25. It’s a 50 mile relay and ultra marathon. I think I’m running 10-13 miles. So, wish me luck as I meet both of these challenges…and crush them! As someone who has been on both the reviewing end and submitting end of resumés, I can tell you it’s pretty stressful for both parties. It’s never easy. If you end up scoring an interview, it’s as much of an interview of the candidate by the company as it is an interview of the company by the candidate. Constant thoughts of, “Will I fit in here?” and “What is the culture like?” “Does the staff have a good sense of morale about the company?” “Does the company foster teamwork?” And that’s just once you get your foot in the door and pass-go through the approved set of human resources-sanctioned standard questions. Backing up and before we get to an interview (fingers crossed), I’ve found a few online tips about preparing cover letters and resumés, as well as preparing for interviews. The first set of tips come courtesy of a great lifestyle blog that I follow, Cupcakes and Cashmere, in a series called Career 101. You’ll find tips on building your resumé, cover letter, and prepping for that awesome interview! Next, Forbes Magazine has a great article on “The Cover Letters That Make Hiring Managers Smile.” This article also includes some sample cover letters. Finally, you can search for cover letters and resumés tailored to your field. For example, here’s a cover letter I found after searching for jobs in Marketing from US News. My husband is always telling me I need to get a hobby. Does working out count? I LOVE going to the gym. 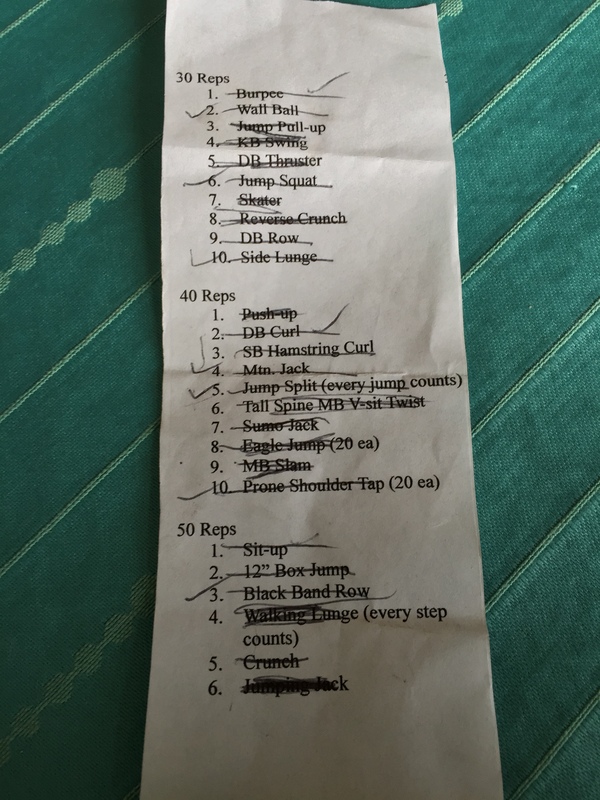 Let me rephrase that…I LOVE going to my gym. 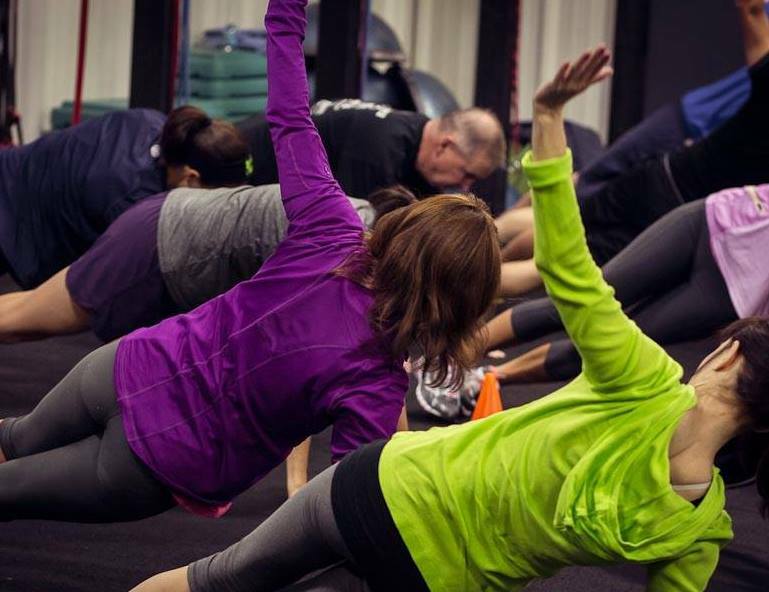 Ki’netik Fitness is more than a gym. It’s a really tough workout with a lot of people who are also a little obsessed with it just like me. I don’t think that’s a bad thing. It’s healthy and everyone is very sweet and very motivated. The community makes me want to show up everyday. I recently just completed a triathlon as part of a relay team. I was the runner and was pretty proud of my 8 minute/mile time. It was also a fun experience participating with my good friends, Becca and Erin, since I don’t normally workout with them. If you don’t have time to join a gym, or run regularly, the 7 minute workout app by Wahoo Fitness (free in the app store) has been great as a mini-substitute. I highly recommend it. I use it to supplement my workouts, especially on the weekends. You have to stretch first. So I LOVE to run. BUT, I’m pretty competitive and find that I don’t like timed races. 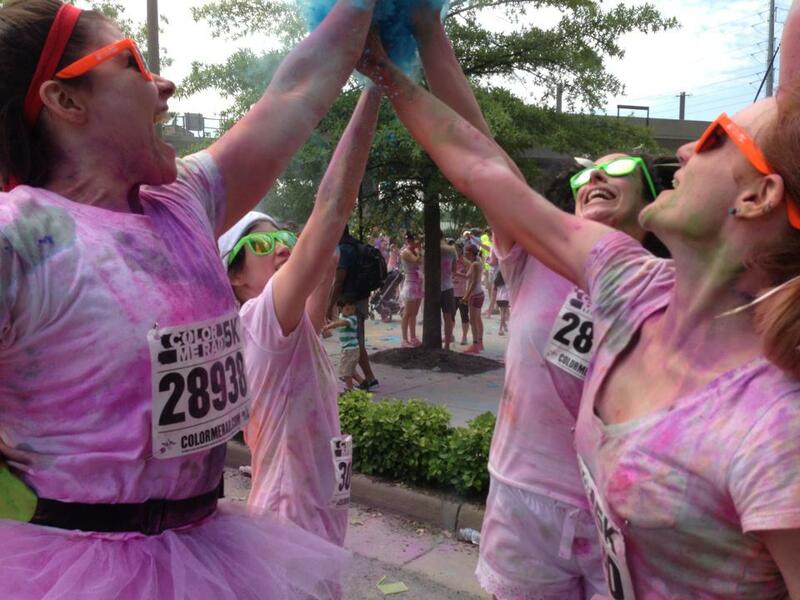 Also, I heart bright colors so when some friends invited me to Color Me Rad in D.C. last year, I was psyched! 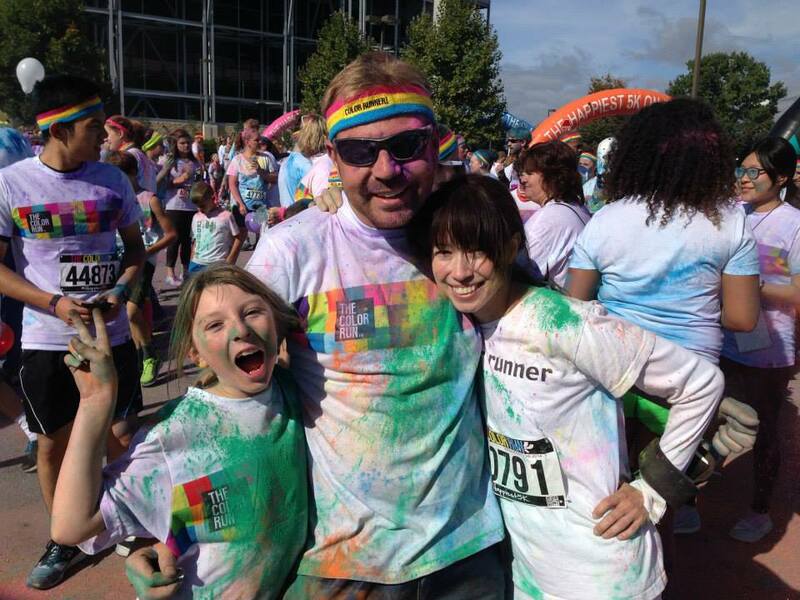 Last fall, I ran the State College Color Run with friends from my gym and then this year I ran with my dear friend, Kevin Conaway, and his lovely wife, and sweet daughter, Emily. So much fun and an easy run. So I’m short. So, I started a tumblr called “taller than Whitney.” I pretty much do most updates on vacation. Some of my favorites include some of the cool people I’ve been fortunate enough to work with like Tim Gunn and Chris Isaak. Also, meeting Joe Manganiello was DEFINITELY a very memorable DragonCon moment (sigh). 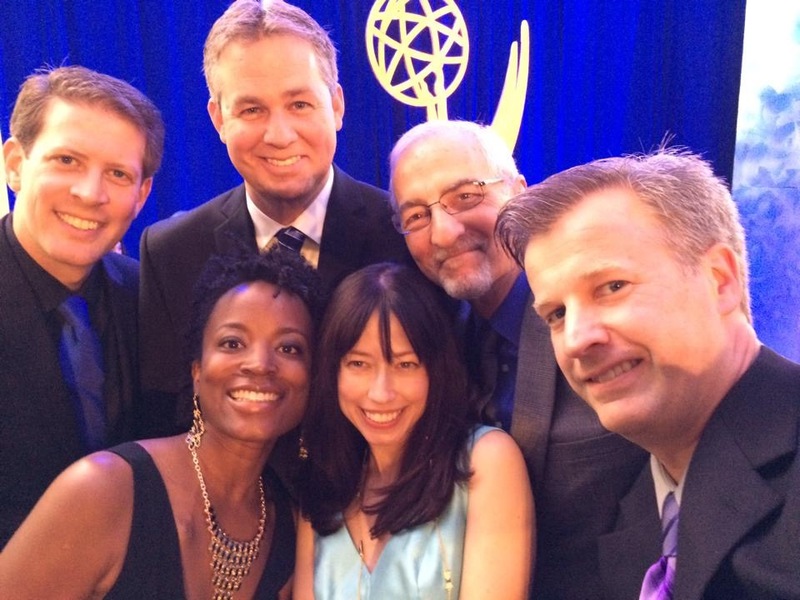 Mid-Atlantic Emmy Awards! 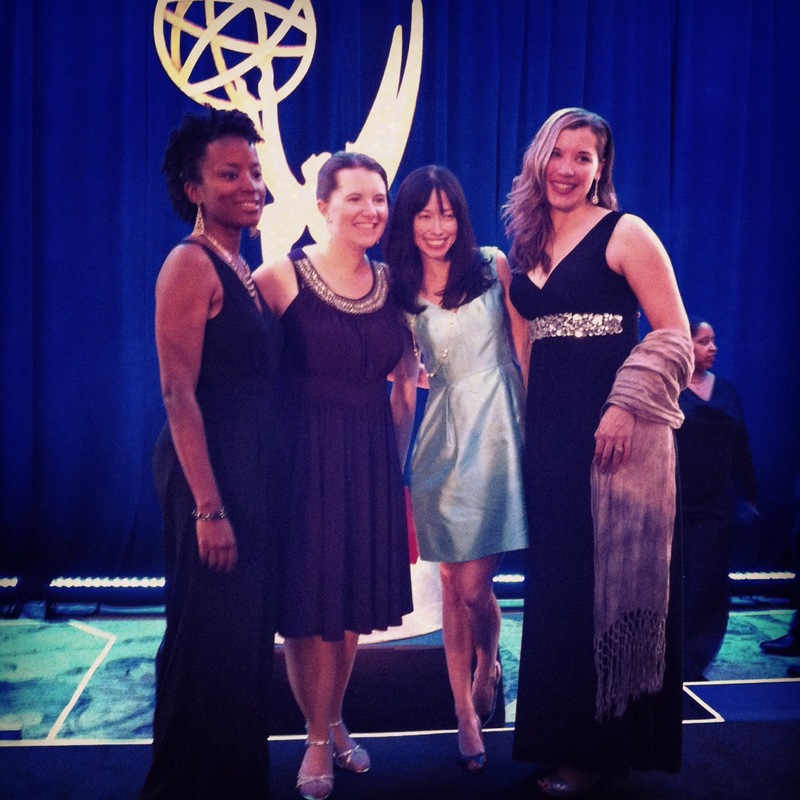 The ladies posing on the Emmy stage. 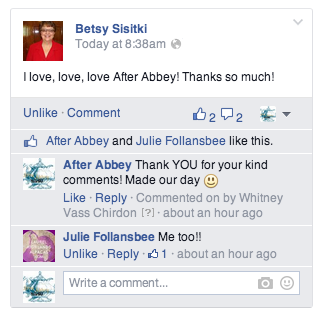 Some Sweet After Abbey Posts!